Tabitha Ponte is a licensed architect and builder, a philanthropist, a mother and a wife who’s leading Ponte Health. She’s based in Orlando, Florida, specializing in single source delivery, resources management and best outcomes serving the healthcare sector exclusively. This week on EntreArchitect Podcast, Building a Large Firm by Starting Small with Tabitha Ponte of Ponte Health. Tabitha was seven or eight years old when she told her mother how she felt about spacial structures. She felt like she saw the void, not the stuff. In the car in Venezuela, where she spent her childhood, Tabitha’s mom told her all about architecture and engineering. Her mind was made up: she was going to be an architect. Tabitha had family members who were in architecture, one of whom designed and built his own house. She spent significant amounts time in that house and vividly remembers the influence that the fact that he built it himself had on her. She was very involved in music as a child, but always knew that she wanted to attend architecture school. She went to architecture school in Fort Lauderdale, Florida and worked all through college. Because of this, she actually finished her IDP hours before she graduated college. Tabitha worked for three different firms all though college, and was eligible for her licensure exams the year she graduated. She worked to learn the business of architecture and construction from the inside. When she graduated she was given the opportunity to step into a leading role as an architectural project manager. Everything fell apart when the market crashed. Firms disappeared overnight and work halted. All of that eventually lead her into Chicago. She had visited Chicago previously, and thought that one day she may work there. 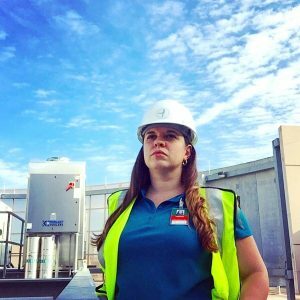 Because of the market crash, she didn’t pursue architecture as her graduate degree; Tabitha studied construction instead at Illinois Tech, receiving a management and engineering degree. Tell us about a pivotal change in your career. Tabitha has worked to establish a holistic self in this field who is capable of design, resources management, leading job site and more. She wanted to create a school geared toward that kind of development of sharing what she knew, but felt so much pressure when working on a project to create a school. She got incredibly sick, and was required to make some serious life changes. A little over a year ago, she suffered a stroke. That was the last straw in choosing to walk away from the stress that was making her physically ill and stop pushing against a system that was fighting her. Tabitha dropped everything in Chicago and traveled to fifteen states. She climbed several mountains and found so much bliss there that she thought she might stay. The cold of Chicago followed her to Portland, and she was ready to head back to Florida and to her family. 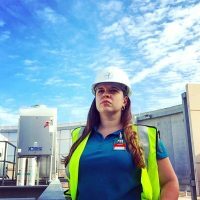 She dove into public works construction and asset management, and found that the government agencies loved her: she’s licensed and could cross over to each different side and play each part well. While Tabitha was pregnant, she made the intentional choice to work from home. Her new look on life allowed her the time to be home with her daughter, read for personal development, exercise, and eat well. How did the transition into your new business happen? Tabitha remembers thinking that she didn’t want to be limited to construction administration rather than being in the field. She wanted to give back, so it made sense to become Ponte Health: the mission is to help expand the health community. Next was the leaping point. It’s really scary to leap, but she knew she could do it. The next step was to find some accessible office space, so Tabitha found a coworking space in Medical City. Next, she persevered to set up meetings with hospital systems. Many people said no upfront, but eventually she got some yesses. Her goal was to be focused and work to serve the right people in the right markets instead of just getting anything to just try to get by. The decision was deliberate: she thought through her dreams of market growth and how to find the need to serve. How many people are working with you currently? Right now there’s three people, but it’s often project dependent. Tabitha’s in the revolving cycle of what it means to be “net 30”, where when you work for someone like a hospital, they’ll sit on the invoice until the 30th day. It’s a difficult cycle to break when trying to build working capital within the firm. How do you fund the firm? In Tabitha’s case, she bootstrapped it and hoped for the best. She also has investors. They have a holdings company above the building company where, in Florida, her friends and family have leeway to buy into the company. There are limitations as to how much money they can give you. Currently they have about 55 micro-investors. If you can get a loan or have enough saved up, you will hopefully get to the point where a client will minimally fund your work without needing to struggle. For Ponte, it took them about a year. The second you go outside those boundaries, the SEC gets involved, perhaps a lawyer is involved to set your shares. How did you choose to spend your money when you were starting out? Instead of saving a few hundred dollars on themselves, they chose to invest that money into highly targeted ads. Early on, Tabitha invested in a marketing campaign in the Orlando Medical News. They made the effort to put their money into targeted campaigns who have helped push their message out into the world of potential clients. Architects are great at talking to one another, but they’re not always great at talking to clients or potential clients. If you’re starting a firm, you need to stop and look at your reach. Are you connecting with the right people? Instead of connecting with architects or architects who are working on hospitals, Tabitha reestablished her social media to connect with those she wanted to serve: executives in the design or departments of hospital systems. Tabitha is very deliberate about separating her work life. It’s about being focused. You have to be focused with the work at hand, whether it’s your job or family. Tabitha doesn’t allow them to mix; she’s focused on one or another at one time. That ability to be hyper-focused is what allows her to rest well. She still has stress in her life, but it’s different because it’s her own self-imposed stress, not something put on her by a company or a boss. As a business owner, her stresses have changed and her ability to find balance has grown. Tell us about your campaign for Puerto Rico’s babies. Because Tabitha’s mission is to help expand the healing community, the issues affecting babies post storm are in direct alignment with that mission. The various issues are compounding in Puerto Rico right now, so Tabitha has worked to connect with a pediatric hospital who is taking in all the small babies and children in the vicinity. She’s working to assist the hospital to meet their needs where they’re at with supplies of food and equipment. Want to get involved? Connect online by clicking HERE. If you donate $10 or more, you’ll receive access to a hour and a half self defense training! What’s the future look like for Ponte Health? They’re working to serve as an integral turnkey company. Tabitha is always reaching toward the goal of creating a true comprehensive health system along the lines of their own real estate development and more. She sees the company deeply involved in research, scientific-, building-, and technology-wise. Connect with Tabitha online at pontehealth.com. Visit her online on Instagram, Facebook, and Twitter.